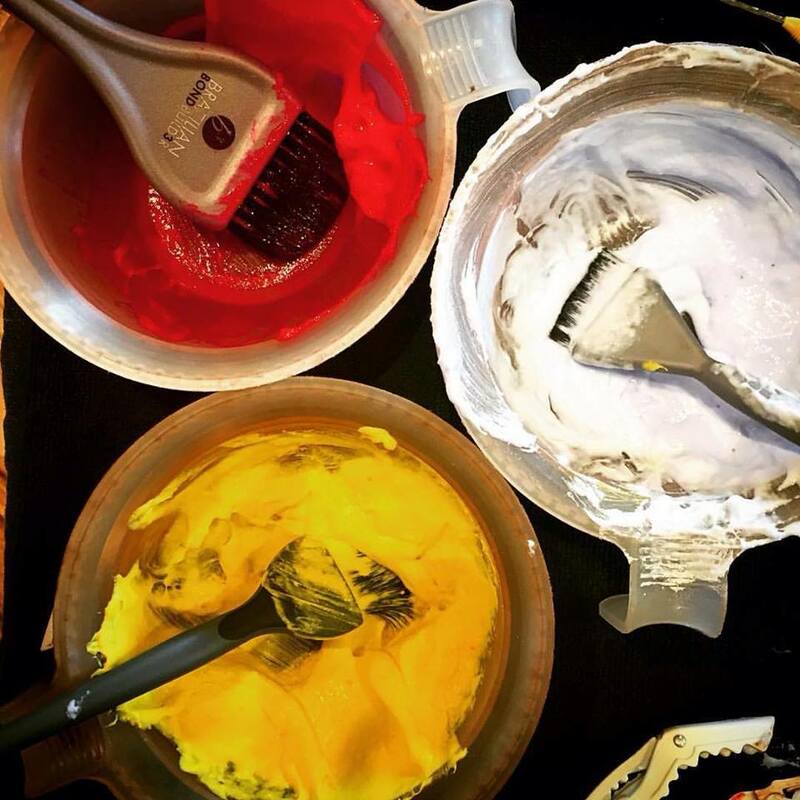 Welcome to Boulder Beauty Bar – An intimate hair salon located in Boulder, CO. Please see below for a description of the Boulder hair care services we offer, as well as pricing. This can be taking off length or removing bulk. Whether we are keeping it long or taking it short for a bold new style, it’s all a haircut. From pixy cuts to bobs, from bobs to long locks. I use the Italian style cutting technique taught to me by Framesi to deliver a prevision cut tailored to your head and unique style. Whether shears are required, a razor or texturizing shears, I have all of the tools to deliver a haircut that is fresh and up to date. This service comes with a shampoo and blow dry, and enough time built in for an in depth consultation so we can make sure we’re on the same page to build a cut perfect for you! Book your boulder haircut appointment today! Boulder Beauty Bar is a fully equipped Boulder hair salon for men of all ages. With training in both Framesi Italian style and American Barbering, I’ve got you covered! Whether you’re seeking a tight fade with my Oster Titan clippers or a gentler scissor over comb haircut, I can handle it, and you’ll love the results. Between you and me, men’s hair cuts are my favorite, and I love staying on top of all of the latest trends. From modern GQ to classic barbering, we have the look for you. This service is for those that are 12 years old and younger. I work with mom or dad during the consultation along with the child to ensure all are happy with this new style. This service comes with a shampoo and blow dry (depending on your child’s comfort level), and I always use Kevin Murphy’s Untangled Leave In product to remove pesky knots in fine hair. This service is for boys and girls alike, and your children receive the same specialized Italian style technique I provide to all of my clients. Not ready for a full haircut, but need a touch up around the ears, neck or your bangs? Bang and neck trims are only $10, and are complimentary in between your haircut appointments! These are quick services, so if you don’t see the time available in my online schedule, shoot me a text at 928-899-7321 and we can most likely fit you in! Don’t be shy! Perfectly framing bangs and/or a clean neck line can make or break your style, so let me help you keep up with your look! Do you need your roots touched up, or do you need all of your color refreshed or changed entirely? If so, an All Over Color service is just what the doctor ordered! I never let you leave with fresh roots but faded out ends. This service comes with a toner or gloss for your ends. Using Wella Professionals color line, I can take you from blonde to red, brown to black and everything in between. Through our consultation we can determine the right shade, tone and level for and discuss how to get there, whether we get there with permanent or semi-permanent color. Wella Professionals hair color is full of conditioning agents, leaving the hair silky, shiny and healthy! Wanting to brighten up your hair? We can do that with some sunny highlights! 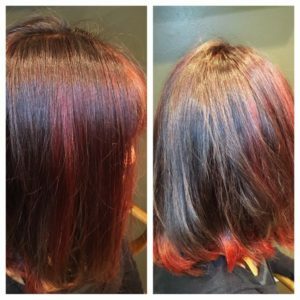 A partial highlight at this Boulder Hair Salon includes the sides and top, leaving the underneath in its natural single colored state. We can make you sunkissed, a “natural” blonde or chunky and funky. This service includes a consultation, lots of foils, a shampoo, dare I say amazing head massage and a blow dry. If you’re looking to go significantly lighter all over, then a full head of foiled highlights is just for you! Bring a good book or relax in our cozy Boulder Hair Salon chair and pour through one of my magazines as it does take some time to foil an entire head of hair. With this service, you receive a full consultation, lots & lots of foils, a shampoo, an absolutely amazing head massage and a blow dry. Do you want to change your base color but also want the dimension that highlighting provides? This service is for you. Yes, it can all be done at the same time! First, I carefully place the foils throughout your hair and then color in between the foils. All of your hair gets colored and we cut down the time you’re in the chair (we all need more time, don’t we?!). No need to book a separate consultation as the timing of this service allows for a thorough consultation as well as shampoo and blow dry. This is for those of us with platinum blonde (or pink or lavender, etc.) hair. A double process is when we bleach and then tone your hair. Want to find out if blondes really do have more fun? Book your double process appointment today! Be prepared, as this service can take a decent chunk of time depending on the condition and current darkness of your hair. This service comes with a full consultation, a shampoo and blow dry. For $20, upgrade to a conditioning treatment to keep your new blonde locks healthy and shiny. After we consult on the style you’re after for your blow out, I will shampoo and condition your hair with a relaxing head massage and then style your hair with a rounded brush and the hair dryer. We will perfect your look with Kevin Murphy styling product. To set your hair with a hot tool is a $10 add on. If you’re looking for a style for a special night out, book your blow out today! Usually best on hair that is one day dirty. We set your hair with a hot tool to add body and smoothness to your hair, and then depending on the desired look, we pin up your hair! Pictures are always helpful for an updo consultation. Remember that pictures of styles you don’t like are sometimes as important as pictures of styles you love. Your wedding day is important! For this reason, a bridal hair consultation is highly recommended. A bridal consult takes at least an hour of time, and should be scheduled at least ­­­­one month in advance of your special day. 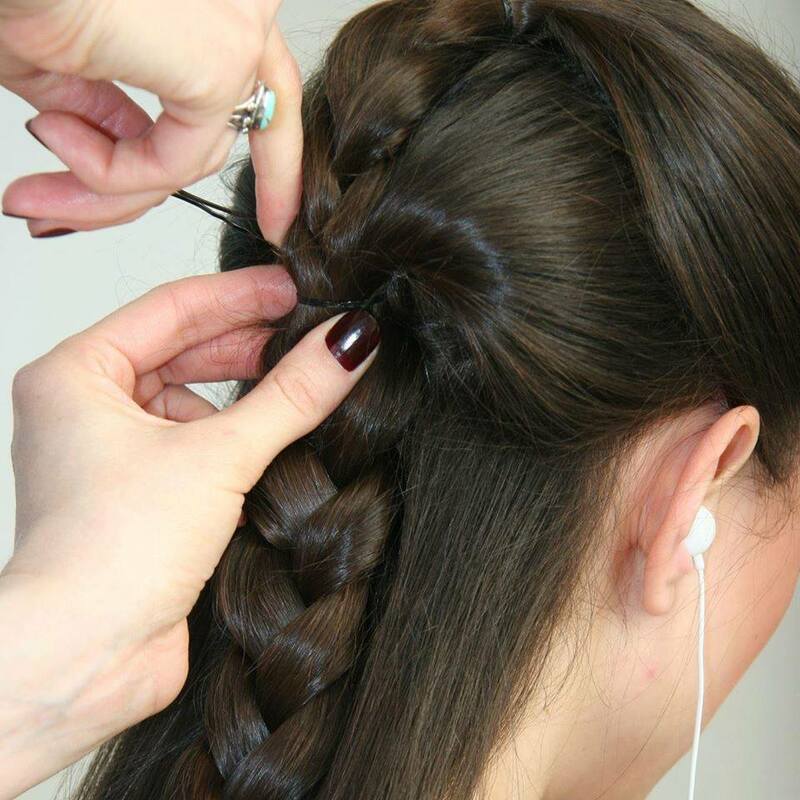 At your bridal updo consultation, we’ll pinpoint the exact style you want when you walk down that aisle, and we’ll discuss timing and pricing for your big day. The dry Colorado climate can be rough on your hair! We all need a little moisture sometimes. I use Kevin Murphy’s conditioning masks. If you’ve never tried Kevin Murphy hair care products, you haven’t lived! After a refreshing shampoo, I massage a deep conditioner into your hair and let it sit for 10-15 minutes, allowing it to fully penetrate your hair shaft, then we rinse and dry! It’s instant gratification as you will feel and see a difference in the quality of your hair immediately. Combine and save! Book a haircut and deep conditioning treatment at the same time and save $30 off of the typical price! Let’s chat! Consultations are a FREE 15 minute service and is always recommended when you are looking for a really big change or for a color correction. In these 15 minute appointments we will discuss your current hair, the look you are hoping to achieve, the steps we will take to you there, and maintenance and upkeep. I understand your hair is an investment and an outward expression of your personality and inner self, and I want to make absolutely sure we are able to get you the look you want, time and time again. For this service, pictures are helpful, so feel free to email me any pictures that will help me understand the look you’re after. Found the look you want in a magazine? No problem! Bring in the magazine to your consultation and we’ll take a look together and discuss the possibilities! Contact me today to set up your free consultation!